My name is Phoebe Weseley and I own River Run Farm, LLC. I am an amateur rider who has owned my own farm for over 20 years. I grew up in Manhattan as the daughter of two doctors. When I was a teenager, my parents were in upstate NY and saw a skinny neglected Arabian and bought him, even though they knew nothing about horses! Eventually, after many falls, everyone in my family gave up on riding except for me! I was not born with the talent of a Tori Colvin or a Lillie Keenan, but I do work hard. 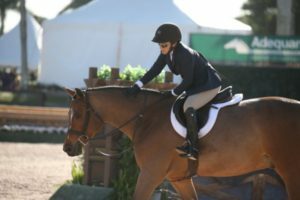 I have had more success in the show ring than I ever dreamed I would; in addition to hard work, I have the support of my husband and am a perennial student of the sport! I enjoy bringing along young horses and ponies as well as helping my daughter succeed on her adult jumper. I do vinyasa yoga on my jade yoga mat religiously every morning.